Internet Explorer 6 (IE6) in Windows XP Service Pack 2 (SP2) or Service Pack 3 (SP3) may stops responding and crashing when users try to a visit a web site. 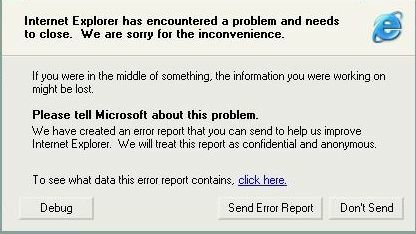 The IE6 not responding problem also affects shell browsers based on IE engine such as GreenBrowser and TheWorld. In these cases, all IE windows and tabs will be not responding, closing and exit with the following error message. If user clicks on the error report link, there following error-signature information will be shown. 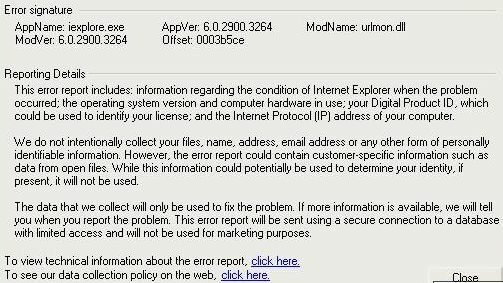 The issue is caused by security update 942615 (MS07-069) which was released in December 2007, which probably rolled out KB942367, which also requires users to manually create and enable the Iexplore.exe registry entry. The problem has been identified by Microsoft, and KB946627 hotfix or patch have been made available to address and fix the error by creating the required registry key. Download and install the WindowsXP-KB946627-x86-ENU.exe, or use the following alternative manual steps or run registry key file to add the registry key. Type FEATURE_PROTECT_DECOMPRESSION_FILTER_FROM_ABORT_KB942367, and then press ENTER. Right-click FEATURE_PROTECT_DECOMPRESSION_FILTER_FROM_ABORT_KB942367, point to New, and then click DWORD Value. Type an asterisk symbol (*), and then press ENTER. The asterisk symbol (*) represents any process name that uses Urlmon.dll. If you want to make this change for an individual application that uses Urlmon.dll, you can use the name of that application instead of the asterisk symbol (*). For example, you can use Appname.exe. Right-click the asterisk symbol (*), and then click Modify. An easier workaround is to simply download and execute the iekb942367.reg (no longer available) file to insert the missing registry value.